If your granny recently purchased her very first smartphone, she's not alone. 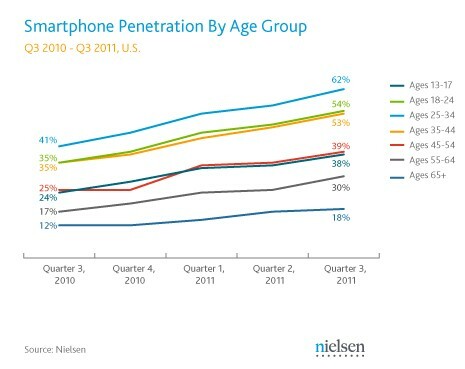 According to the latest Q3 figures from Nielsen, Americans between the ages of 55 and 64 are adopting smartphones at a faster rate than any other age group. Just about 30 percent of all mobile-equipped, soon-to-be seniors now own a smartphone, marking a five percent jump over Q2 of this year. But they still have a long way to go before catching up with the 25-34-year-old population, 62 percent of which wield an intelligent handset -- higher than any other age demographic. 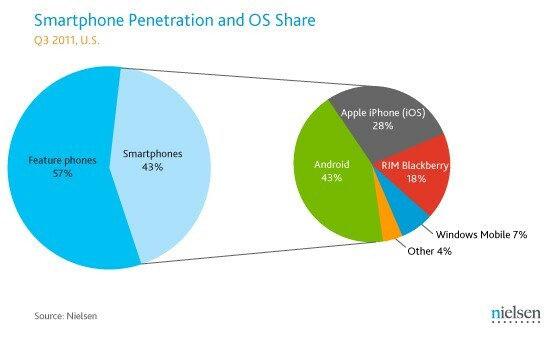 Overall smartphone penetration stands at 43 percent across US cellphone owners, with Android (still) leading the way with 43 percent of the OS market, and Apple leading all manufacturers, with a 28 percent share. Check out the full report at the source link below, or head past the break for a more graphic demographic breakdown.